Designed for Preschools and Nurseries our small animal experience gives children tactile access to a range of small ducks, bantam chickens, guinea pigs, 2 Friendly Labradors, Sugar Gliders, Pickles our Pygmy African Hedgehog, Tobias the Horsefield Tortoise and Plop our Barn Owl. and confidence building whilst at the same time keeping the animals stress free and happy. All this can be done indoors with minimal disruption to your daily routine and schedules. We have all the appropriate equipment to be able to set up inside and manage all the necessary health and safety elements. Our staff have full CRB checks along with Public Liability Insurance for £5 million. "We really enjoyed our visit from Ark Farm to our Reception and Year One classes. The children were all able to get close to the animals and handle them. Shannon was very knowledgeable when the children asked questions and encouraging to the children who were a bit nervous around the animals. The star of the show was Plop the barn owl who everyone was amazed by. 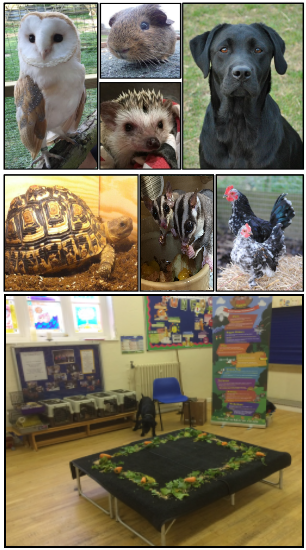 The visit inspired the children to learn more about all the animals they met. It was a stress free morning for the teachers because everything was set up and tidied away promptly for us and we had lots of information sent to us to share with the children before the visit. Thanks for a great experience!" "We were very pleased and pleasantly surprised at how organised the event was, they were very professional, friendly, happy, polite,they were able to answer all questions, used age appropriate language. the story telling was well worth the extra money. A great fun day had by all children and staff. thank you and we will be inviting you back soon."